With a strong representation of returning galleries as well as several new additions, this year’s line-up features a number of galleries from Europe and North America. Returning galleries include Marianne Boesky Gallery (New York), Galerie Daniel Templon (Paris, Brussels), Carlier | Gebauer (Berlin), Galleria Franco Noero (Torino) Victoria Miro (London) and In Situ-Fabienne Leclerc (Paris), which will be joined by first-time participants Marlborough Gallery (New York, London, Barcelona, Madrid) and Waddington Custot (London). The number of galleries participating from the Middle East, North Africa and South Asia reaffirms Art Dubai’s role as a cornerstone of the regional art scene. In addition to 12 galleries participating from the UAE, Art Dubai is delighted to welcome again Athr Gallery (Jeddah), Chatterjee & Lal (Mumbai), Dastan’s Basement (Tehran), Experimenter (Kolkata), Selma Feriani Gallery (Tunis), Gypsum Gallery (Cairo) and Zawyeh Gallery (Ramallah) as well as newcomers Al Marhoon Gallery from Algeria and Ab/Anbar and Mohsen Gallery from Tehran. Reflecting its global reach, Art Dubai 2017 will feature its highest ever number of galleries from South America, with galleries from Peru and Uruguay attending for the first time. Exhibiting galleries will include Piero Atchugarry Gallery (Pueblo Garzón), Revolver Galeria (Lima), D12 Proyectos de Arte (Santiago) and Vermelho (Sao Paulo). This selection of galleries will present leading artists from the Middle East including Agial Art Gallery (Beirut), exhibiting the ‘icon of Arab graphic arts’ Mustafa Al Hallaj (1938-2002), ArtTalks (Cairo) presenting Egyptian modernist Mamdouh Ammar (b. 1926), as well as Gallery One (Ramallah) showing Palestinian-born Sliman Mansour (b. 1947). Shirin Gallery (Tehran, New York) will showcase works by Iranian artists Hadi Hazavei (b. 1940) and Houshang Pezeshknia (1917-1972). Pieces by leading modernists from India and Pakistan will be exhibited by Grosvenor Gallery (London), which will present works by recently deceased artist Sayed Haider Raza (1922-2016), a pioneer of Indian Modernism, and Pakistani artists Zahoor ul Akhlaq (1941-1999) and Anwar Jalal Shemza (1928-1985), offered by Jhaveri Contemporary (Mumbai). Presence from the African continent will include, among others, Nigerian artists Ben Osawe (1931-2007) and Muraina Oyelami (b. 1940), presented by Tafeta (London). 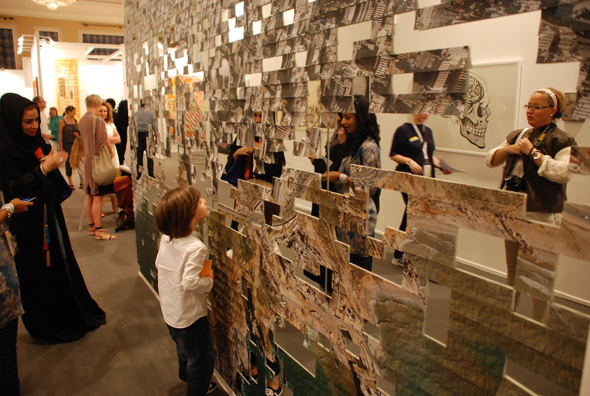 Art Dubai is a leading international art fair, welcoming the global art world to Dubai each year. The fair acts as a gateway to art from around the world and is the preeminent place to discover works from the Middle East, Africa and South Asia. Art Dubai 2017 will feature 277 artists from over 40 countries, representing more than 60 different nationalities. With almost three quarters of galleries returning to the fair, Art Dubai 2017 will feature 90+ galleries from 43 different countries. Mirroring its hometown Dubai, the fair embraces the city’s fast pace, ambition and quest for innovation. Art Dubai Contemporary features some of the world’s leading contemporary artists and galleries, exhibited alongside emerging talent and budding spaces from across the globe. Reflecting the fair itself, the selection committee for Art Dubai Contemporary is comprised of local and international specialists, ensuring the fair remains at the pulse for new trends from the region and beyond. The committee for Art Dubai Contemporary 2017 included returning members Ursula Krinzinger (Galerie Krinzinger) and Andrée Sfeir-Semler (Sfeir-Semler), who were joined by new members Isabelle van den Eynde (Gallery Isabelle van den Eynde) and Glenn Scott Wright (Victoria Miro). Independent curators Sam Bardaouil and Till Fellrath joined committee as guest curators. With the appreciation of modern masters from the Middle East, Africa and South Asia gaining momentum internationally, Art Dubai Modern is the only platform worldwide for museum-quality works by masters from these regions, whose pieces are coveted by patrons and institutions alike. Art Dubai Modern works with a selection committee of leading scholars and curators in the field to ensure the quality of exhibited artwork, including Savita Apte, Iftikhar Dadi, Catherine David, Kristine Khouri and Nada Shabout.